NEW YORK (SI.com) -- The New York Red Bulls have announced that Juan Carlos Osorio has resigned from his position as head coach. Assistant coach Richie Williams will serve as interim head coach for the remainder of the season. The Red Bulls are currently last in Major League Soccer's Eastern Conference with a league-worst record of 2-4-16. Their current points total of 10 is threatening to eclipse their previous worst of 15, which the team set in 1999 (when it was called the MetroStars) and stands as the worst regular-season finish in MLS history. "I want to apologize to the fans for the results this season," said Osorio in a statement. "I want to thank the players for their hard work. I would also like to thank the club for the opportunity to coach the team for the past two seasons." Under the Colombian-born Osorio, New York reached the MLS Cup championship game last season, but has been unable to capture that run of form in 2009. In two seasons with the club, Osorio is 12-27-13, the worst mark in the league over that period. The low point came earlier this month when the Red Bulls were eliminated from the CONCACAF Champions League at home at Giants Stadium by W Connection, an amateur club from Trinidad and Tobago. "It has been a difficult season for Juan Carlos and he felt that it was in the best interest of the team to step aside," said Red Bulls managing director Erik Stover in a statement. "I want to personally thank Juan Carlos for his efforts with the Red Bulls organization. It was under his leadership last season that the team won the Western Conference Championship and reached the MLS Cup Final for the first time in franchise history. We wish him well in his future endeavors." 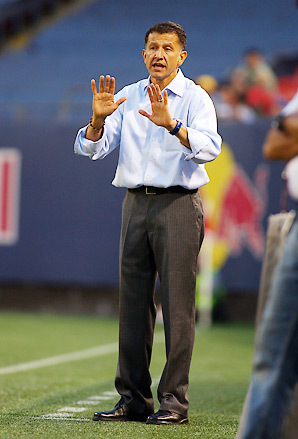 Osorio, 47, joined New York following the 2007 season after guiding the Chicago Fire to the Eastern Conference final. He had spent two seasons in New York previously as the team's strength and conditioning coach before taking a similar post at English Premier League club Manchester City in 2001. Osorio also coached Millonarios in his native Colombia before returning to MLS in July 2007. Williams, now in his fourth season as an assistant, will get the interim label for the second time in his career. The 39-year-old also served as Red Bulls interim head coach for nearly two months during the 2006 season after Mo Johnston was fired. Williams went 4-3-2 over that stretch until the club hired former U.S. national-team coach Bruce Arena. The Red Bulls have been one of the most woeful franchises in league history, but are due to move into a new state-of-the-art, 25,000-seat soccer-specific stadium next season in Harrison, N.J.